This book is part of a three-book series for the sequence of electric power electives taught in most large universities' Electrical Engineering departments. Advances in hybrid-electric cars and alternative energy systems, coupled with the severe environmental problems associated with hydrocarbon-based fuels, are driving renewed interest in the electric energy systems (EES) curriculum at the Undergraduate level. Ned Mohan has been a leader in EES education and research for decades, as author of the best-selling text/reference Power Electronics with Wiley and a series of textbooks self-published under the MNPERE imprint. Mohan leads a consortium of 80+ universities working to revitalize electric power engineering education. These texts are based on the integrated curriculum developed over nearly 15 years of research in education in this field. 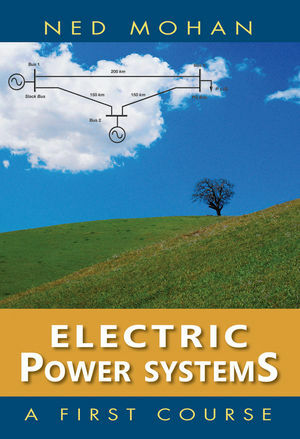 Since the subject of Electric Power Systems encompasses a large and complex set of topics, a unique aspect of this book is a balanced approach in presenting as many topics as possible on a fundamental basis for a single-semester course. These topics include how electricity is generated and how it is used by various loads, and the network and various apparatus in between. Students see the big picture and learn the fundamentals at the same time. Sequencing of these topics is considered carefully to avoid repetition and to retain student and reader interest. However, instructors can rearrange the order for the most part, based on their own experiences and preferences. Ned Mohan is the Oscar A. Schott Professor of Power Electronics in the Department of Electrical Engineering at the University of Minnesota, where he has been teaching for 33 years. He has written five textbooks; one of them has been translated into several languages.